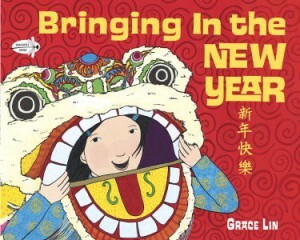 This story is a perfect introduction for youngsters to the Lunar New Year. It follows a Chinese family as they prepare and celebrate the coming new year. Simple sentences and colorful, energetic cartoon illustrations depict the cleaning, decorating, cooking, dressing and celebrating along with the reasons for each activity to bring in the New Year. The straightforward explanations for each preparation helps the reader understand how symbolic and significant each ritual is for this major Asian holiday. The brief, yet descriptive, sentences such as “Jie Jie sweeps the old year out of the house” and “Ma Ma makes the get-rich dumplings” remind me of a haiku in its poetic succintness. Additionally, there is a fold out spread for the finale of the story and a more detailed description of the holiday and celebration for parents at the end of the book. The inside cover of the book is decorated with illustrations and labels of important things that are symbolic during the New Year such as red envelopes, good luck sign, spring lantern, decorated kumquat tree, etc. Although the book is very veg-friendly, veg families should note that there is one illustration of a whole fish (symbolic of wealth) on the inside front and back cover decoration. 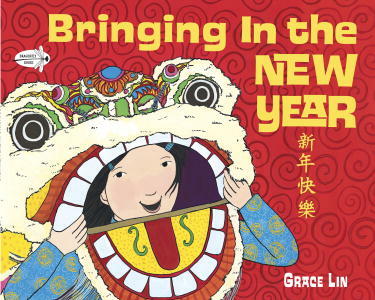 Overall, Grace Lin does a fantastic job of cramming in so many details yet keeping it simple and interesting for young children. Sounds like a good book. Great point about the skin tones of characters. A rich diversity should have been illustrated.